There are millions of reasons to finally visit Italy when you are on vacation. Legendary old cities with magnificent architecture, desert islands with crystal clean water and secret blue lakes, Florence being a cradle of Renaissance architecture and rich museums, Venice with its romantic flare and gondolas, Roman ruins and marvellous beaches, Greek temples and the world’s largest number of World Heritage Sites, handmade delicious pasta and a great variety of cheese…Have I forgotten something? Oh yes! And, of course, shopping! 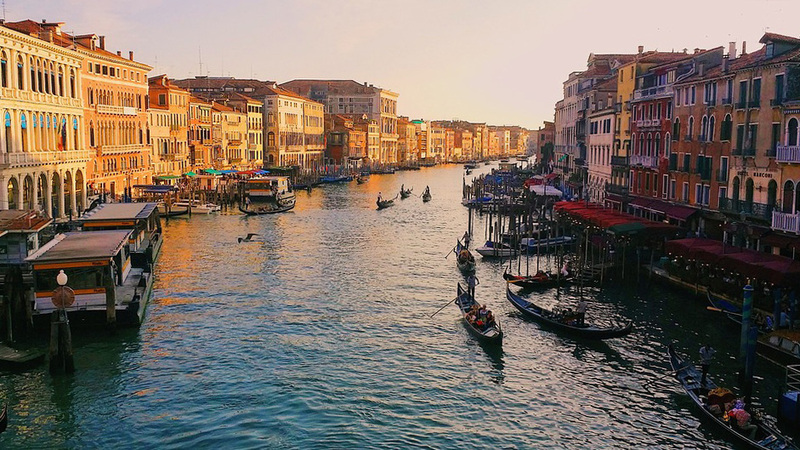 Italy is the cradle of fashion and style with different types of markets, antique shops, designer outlets, shopping centres, outlet malls and high-end boutiques. Here you can buy everything you possibly need (and don’t). In this article we bring to you the best shopping tips on best buys, bargains and how to shop smart. According to the survey (International Guideline on Travel Problems) we’ve conducted among our users, shopping is one of the pressing issues for many world travelers. Together with our locals we managed to combine shopping tips from the whole Italy. So here it goes. 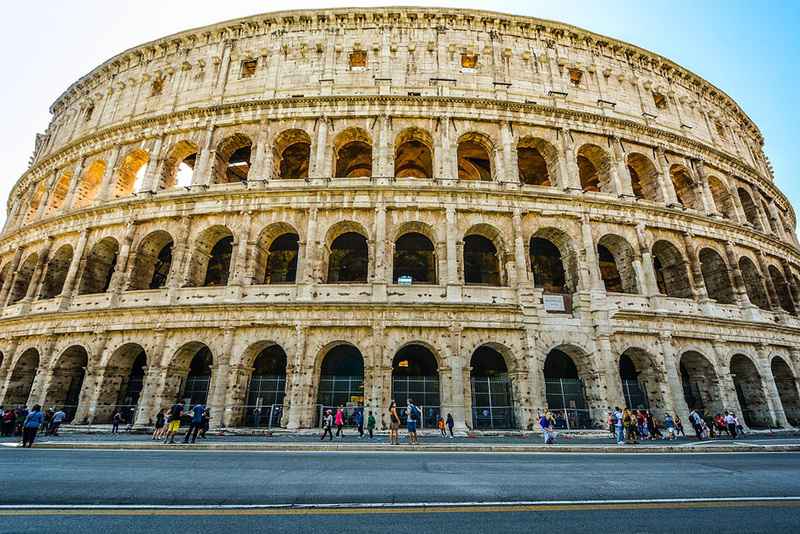 Whether you arrived in Rome to shop for designer dresses and chic bags or something cheap and stylish, Rome is one of the best shopping cities in Italy. Rome houses everything you can possibly desire. Alongside Italy’s finest designers shops and boutiques you will be able to find market stalls and budget independent shops. We’ve chosen the best locations for you to indulge in shopping and grab the best buy. Paciotti Salumeria (Via Marcantonio Bragadin 51, 00136 Rome) is the food store most loved by tourists. It is run by three brothers who are always extremely helpful, knowledgeable, humorous and polite. The shop is packed with high-quality food products at a reasonable price. From balsamic vinegar and antipasto to lightly salted prosciutto ham and cheese, Paciotti Salumeria will definitely leave no one indifferent. 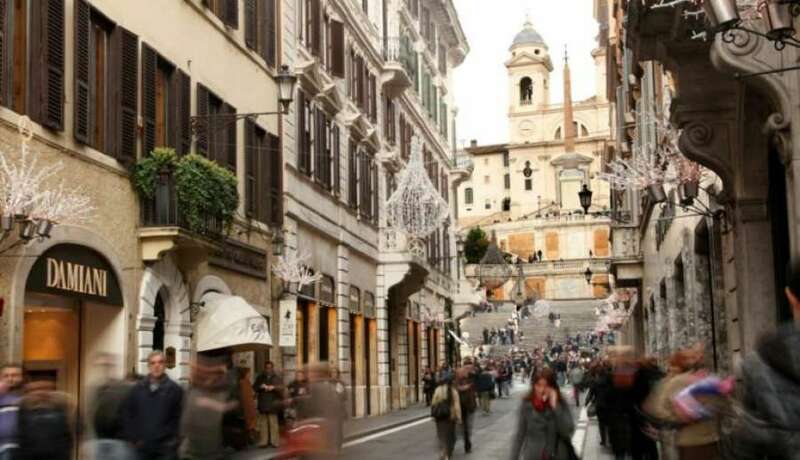 Via Condotti and the Spanish Steps is the main Rome’s designer shopping area. Here you will be able to find shops of famous fashion designers from all over the world. Look out for any celebrities as they love to hang out here. What’s more, alongside high-end boutiques, you will be able to find amazing restaurants and dining areas. Make sure you don’t miss Caffè Greco as this historical place was loved by Goethe, Stendhal and Byron. And, you know, whenever you eat out at such places, you get goosebumps and feel this special connection with the history and people who made an impact on our literature and art. Galleria Commerciale Porta di Roma (Via Alberto Lionello 201, 00139 Rome) is one of the biggest shopping centres in Rome with more than 200 shops housed there. On two floors you will be able to find everything you might possibly need from electronics to sporting goods. Mercatino del Borghetto Flaminio (32 Piazza della Marina) is a mecca for devout fashionistas on Sunday. It’s all about bargain hunting, exclusively barely worn fashion clothes, vintage things and handmade furnishings and accessories. It’s open from 10am to 7pm on Sunday so make sure you don’t miss it during your shopping hunt in Rome. For magnificent vintage Italian jewellery visit Le Gioie di Bortolo (Campo di San Bartolomeo 5536, San Marco). The variety and the design of jewellery and accessories will leave no one indifferent. 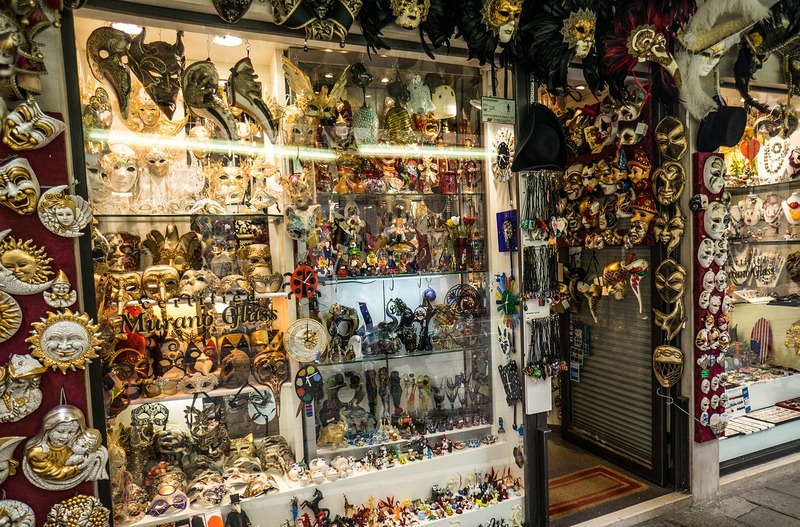 Venice is famous for the carnival held in February every year. Even though it is a secret event, the popularity of the carnival and Venetian masks is awe-inspiring. For splendid masks go to Mondo Novo (Rio Terà Canal, campo Santa Margherita, Dorsoduro 3063). 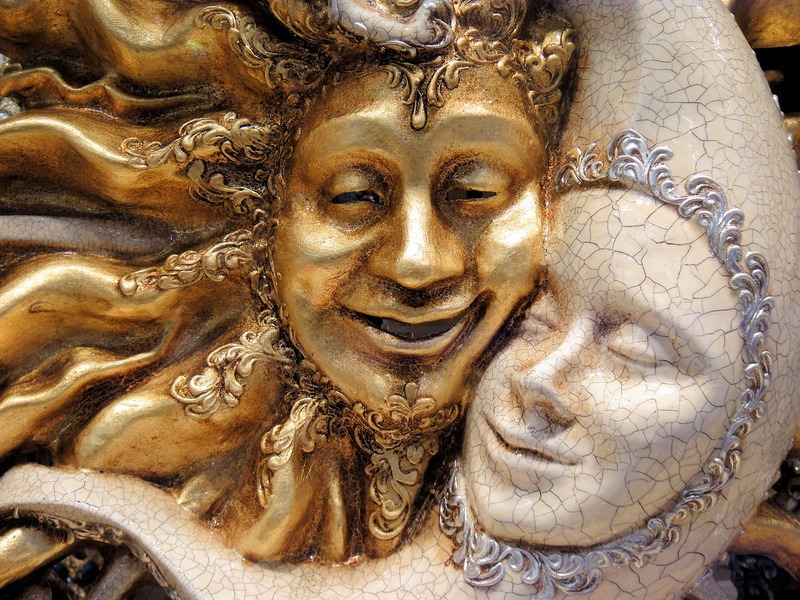 The mask-maker specialises in papier-mâché and custom-designed works of art. The cheaper masks cost about U$20 to U$30. Even if you don’t end up buying a mask, it is definitely worth browsing this store. 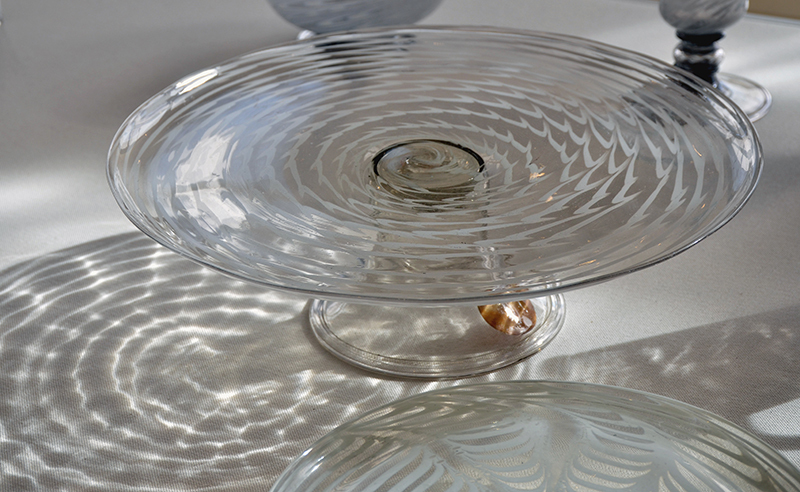 Locals advise that the best Murano glass is manufactured by Venini. It is handmade, it is authentic, it is luxurious, it is unique. For amazing service and a splendid variety of antique objects go to Gioielleria Eredi Jovon (Sestiere San Marco 5325, 30124 Venice). Even though it is a family business, this shop offers outstanding customer service and unforgettable experience. 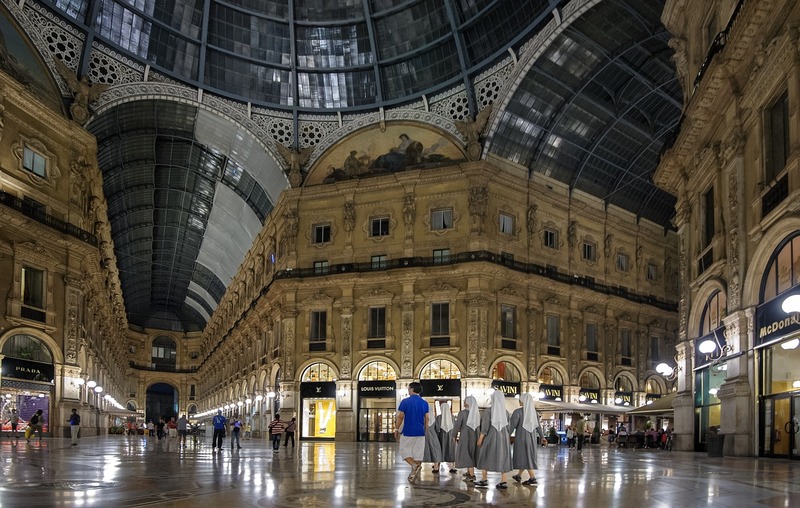 Milan is a mecca for shopping and home to many fashion designers. To plunge into high-end shopping spree browse the Quadrilatero d’Oro (‘rectangle of gold’). Milan’s fashion powerhouse fits into this square comprising via della Spiga, via Manzoni, via Sant’Andrea and via Montenapoleone. The oldest and most famous shopping mall in the world is Galleria Vittorio Emanuele II opened in 1867. It is located just near the Duomo. This glass-roofed arcade houses such major brands as Prada, Louis Vuitton and Gucci. If you aren’t looking forward to spending a fortune for designer labels, head to the city center for smaller-scale outlets like the Corso Como 10 Outlet (Porta Garibaldi), D Magazine (Via Montenapoleone) and Il Salvagente (Via F.lli Bronzetti 16, Milano). For more on Milan and places to visit check out our co-creation article (Tourist attractions in Milan Italy) with a local. This is more than a store, this is a large dining and shopping complex with a number of outlets selling works of art, music, fashion, design and cuisine. It is located in a garage previously owned by Fiat. It was established at the beginning of 1990s by Carla Sozzani, Editor of Vogue and Elle. Today it is a vibrant centre with a garden, shops, conceptual bookstore, art gallery, bars and restaurants to cater for aesthetic tastes of music and design lovers. Definitely worth spending a whole day there, especially, on a rainy day. Venetia Studium houses a wide collection of magnificent silk and velvet pillows, Fortuny lamps, handbags, accessories and furnishings in a wide variety of shapes and colours. This is definitely not the place for budget shopping, however, it’s a fantastic store to shop for splendid works of art to make perfect gifts for your dear ones. The most iconic Fortuny lamp is Studio 76 which costs €3300. 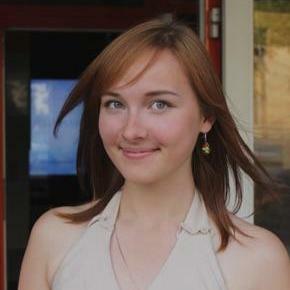 This is a tripod-mounted reflector resembling Hollywood style arc light. Venetia Studium is also the perfect place to shop for luxurious stylish scarfs with prices ranging from €103 for a medium-sized scarf. When in Italy, you can’t but visit the outlet of the worldwide famous fashion brand – Armani. It is just 20-min drive away from Milan. They often have sales and special discounts, so even if you are not planning to spend a lot of money, you might end up finding the best bargain and buy an Armani bag of your dreams. From high-end brand new lines to casual and sport lines, this three-floors white Armani factory store offers a wide range of Armani products to choose from. Being a factory store (spacci di fabbrica), Giorgio Armani outlet offers 30-80% discounts on old collections. Whenever you are coming back from such a shopping country as Italy, you always want to bring some souvenirs for your beloved ones, relatives, colleagues, and maybe just for yourself. The type of gifts always depends on your budget and what exactly you are looking for, something cheap but chic or something luxurious and extravagant. 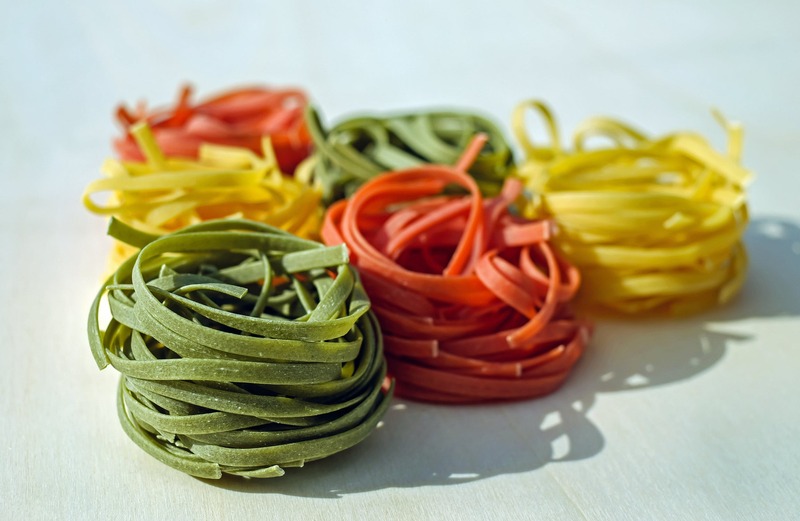 Here we bring to you some cool ideas on best gifts in Italy. olive oil (it’s a must!). 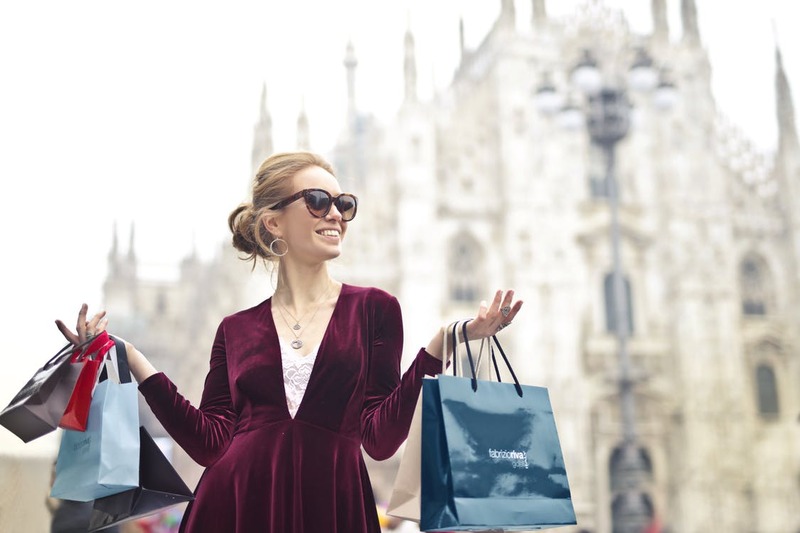 We hope this Italian shopping guide will help you buy a ‘Made in Italy‘ chic dress during your vacation in the European and world’s cradle of fashion and design. For more shopping tips and shopping travel advice stay tuned for more MeetnGreetMe articles. And what are your shopping tips in Italy? You have written well on this shopping topic which was big issue so thanks for sharing your experience on special topic. Thanks for your kind words! Hope now shopping in Italy will be much more pleasant to you. I’ll be travelling to Tuscany in August, I’ll be there for 7 days, I’d like to get a Tailor Made Suit, will I have enough time? I have always been fascinated by Italian fashions. I am interested in establishing an online shop for reasonable priced Italian ties and belts in USA. Please where in Italy can I go for best bargain and possibly a contact? Please, contact local MeetnGreeters in Italy here: meetngreetme.com to get to know about such possibilities. Thank you, Ruth! We do appreciate your feedback and such nice words! 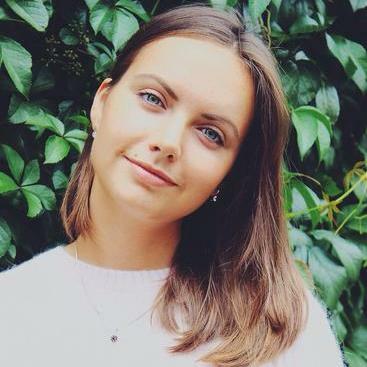 Thanks for your article! It helps me a lot. What a comprehensive list of stores. You definitively did not miss any stores for the fashion lovers. Very nicely written and impressive explanations. Thank you! Thanks for your article. This is very helpful information since I am planning my Italy trip which will happen in September. I am interested in checking out designers such as Chanel, Max Mara, etc in both boutiques and outlets. I am wondering if Milan should be the city that I plan time to do most of my shopping in since you mentioned Milan has many designer shops. I am debating on whether I should do my shopping in Milan or in Rome. Somebody essentially assists to make seriously posts I would state. That is the first time I frequented your web page and up to now? I amazed with the research you made to create this particular submit extraordinarily. Great post. Thanks for sharing.